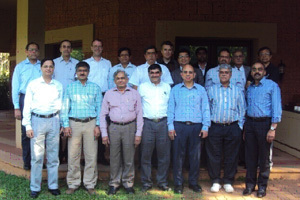 ECMA Celebrated Successful 1st Decade at a special Workshop from 16th to 18th December 2012 to discuss ECMA’s Vision, Mission and Action Plan for the next three years. Most of the Members participated at this important workshop. Participants suggested various key inputs to draw the roadmap about ECMA Future action plan. During the workshop, Members reviewed and finalized its Vision and Mission. Members discussed on various issues related to managing stakeholders, creating ECMA database and Knowledge hub, technology application Studies, opinion building and Communication etc. ECMA decided to deliver its role and responsibilities through various committees under the supervision of the Chairman of the committee. The functions of the committees are supported by the secretariat. Each committee addresses the issues of projects, government related activities, event management, internal & external communication and finance. ECMA participates in policy level discussions with Government agencies and submits its stand.